Lily and Brenda, two wonderful people! I remember imagining with starry eyes my great grandmother saving her “seven months baby.” There’s something about her self-reliant attitude, mixed with wisdom and resourcefulness that inspires me. Perhaps my great Granny didn’t mean to be a hero. Perhaps she picked up that baby out of simple heartache or desperate need. Perhaps she was a mama like me, feeling scared and hoping not to fail, just trying to do what was best for her babies. Perhaps she simply followed the instinct built into any healthy mother, and embraced the stubbornness that seems a part of our family’s DNA, resulting in her refusal to believe her baby was hopeless. Whatever it was, I see glimpses of it every day in the residents at St. Francis Villa. I see people who remember a time when doctors, politicians and “experts” didn’t always have the last word. Sometimes a plain ol’ mama from the backwoods of Florida knows just what to do, steps in and saves the day, saves a life. Sometimes the bravest of heroes are walking around right in front of us, disguised as regular people. 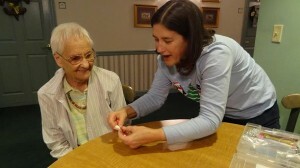 One of my favorite things about assisted living is getting to know those regular people. I love seeing unexpected friendships blossom. I love watching a staff member save the day with a simple smile. I love witnessing the courage of an aging person as she moves forward, day after day, refusing to let anything get in her way. I’m sure teachers, ministers, first responders, and anyone who works with people can tell similar stories of the mystifying resilience of the human spirit. My front row seat just happens to be in assisted living and the stars of my show just happen to be seniors and their families. In a time when we are bombarded with horrific news and tales of terrible villains, I’m glad I get to see plenty of heroes and heroines every day to prove to me that good people are alive and well and are in the majority.